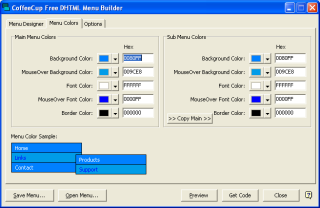 UDM Downloads > CoffeeCup Free DHTML Menu Builder! Create professional-looking DHTML menus for your Website without writing a single line of code. You'll make great, professional-looking DHTML menus for your Website in no time -- no HTML knowledge required! You can completely customize the colors, fonts, and more. It's easy to make your DHTML Menu match the look and feel of your Website. DHTML Menu Builder is able to create both horizontal top menu and vertical side menu navigation systems. You can create multilevel or tiered menus with ease. The menus work in all browsers and even support frames.